Cathryn Shilling is an internationally renowned glass artist, living and working in London. After graduating in Graphic Design from Central School of Art and Design in London, Cathryn worked as a Designer until her family’s move to the USA in 2001 prompted her to pursue a new and exciting creative direction. She studied the art and craft of Stained Glass in Connecticut and then on her return to London in 2004 Cathryn began studying and working with kiln formed glass as well as becoming a student of blown glass at Peter Layton’s London Glassblowing Studio. In 2009 she began making in a studio near her home in London working alongside three other glass artists. In January 2010 Cathryn began to work with Peter Layton in The Gallery at London Glassblowing as Curator and Exhibition Coordinator. Cathryn’s work has been collected and widely exhibited internationally including: TACTILE at Glazenhuis, Lommel, Belgium, New Aquisitions 2017 at Glasmuseum Lette, Coesfield, Germany, Peter Bremers & Cathryn Shilling: A Two Person Exhibition at Schiepers Gallery in Belgium, The CGS Jubileum 20th Anniversary Exhibition at Etienne Gallery, Oisterwijk, Netherlands, The Taos Art Glass Invitational New Mexico, USA; BODYTALK at the Glasmuseet, Ebletoft, Denmark; COLLECT at the Saatchi Gallery with London Glassblowing and Vessel Gallery; East-West Artists Exhibitions in Kyoto, Japan and London; Hot Glass at Contemporary Applied Arts, London; Collective Genius at Vessel Gallery, London. She has exhibited at the British Glass Biennale in 2010, 2012, 2015 and in 2017 her collaboration with Anthony Scala won the Craft & Design Award. She has twice exhibited as a finalist in the Emerge Juried Kiln-glass Exhibition at Bullseye Projects, Portland, Oregon, USA. In 2013 Cathryn won the international Warm Glass Artists Prize and has twice been nominated for the SUWA Garasuno-Sato Glass Prize and several times for the Arts & Crafts Design Award. In 2015 she was number 4 in the Glassation list of ‘The Most Game Changing Female Glass Artists’ and number 25 in the Graphic Design Hub’s list of ‘The 30 Most Amazing Glass Artists Alive Today’. Cathryn’s work was represented in New Glass Review 33. During 2018 Cathryn is Artist in Residence at North Lands Creative, Lybster, Scotland.The CGS Jubileum 20th Anniversary Exhibition at Etienne Gallery, Oisterwijk, Netherlands, The Taos Art Glass Invitational New Mexico, USA; BODYTALK at the Glasmuseet, Ebletoft, Denmark; COLLECT at the Saatchi Gallery with London Glassblowing and Vessel Gallery; East-West Artists Exhibitions in Kyoto, Japan and London; Hot Glass at Contemporary Applied Arts, London; Collective Genius at Vessel Gallery, London. She has exhibited at the British Glass Biennale in 2010, 2012, 2015 and in 2017 her collaboration with Anthony Scala won the Craft & Design Award and twice in the Emerge Juried Kiln-glass Exhibition at Bullseye Projects, Portland, Oregon, USA. 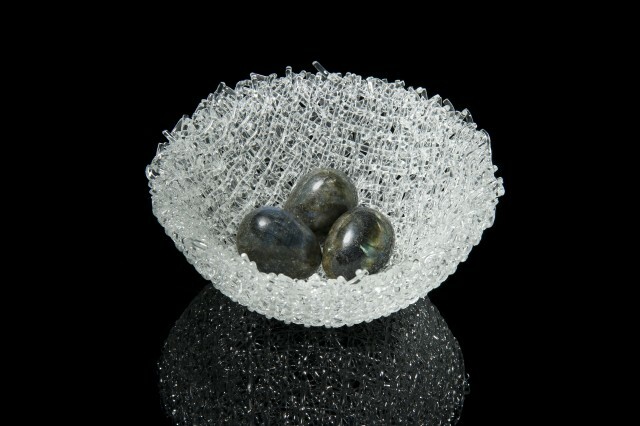 In 2013 Cathryn won the international Warm Glass Artists Prize and has twice been nominated for the SUWA Garasuno-Sato Glass Prize and the Arts & Crafts Design Award. In 2015 she was number 4 in the Glassation list of ‘The Most Game Changing Female Glass Artists’ and number 25 in the Graphic Design Hub’s list of ‘The 30 Most Amazing Glass Artists Alive Today’. Cathryn’s work was represented in New Glass Review 33. Cathryn is a member of the Art Workers Guild and a Fellow of the Society of Designer Craftsmen. During 2018 Cathryn is Artist in Residence at North Lands Creative, Lybster, Scotland.